How much would you sacrifice to sleep better at night? Classical finance theory certainly makes no room for such sentimentality when deploying wealth in the quest for returns. 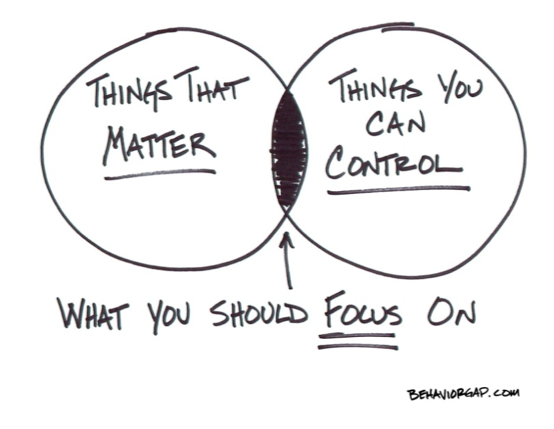 We pay too much attention to the short-term. We overreact to market movements. We invest in local assets or ones we are familiar with and shun similar (or better) risks that are less familiar. We buy when markets are doing well and sentiment is high. 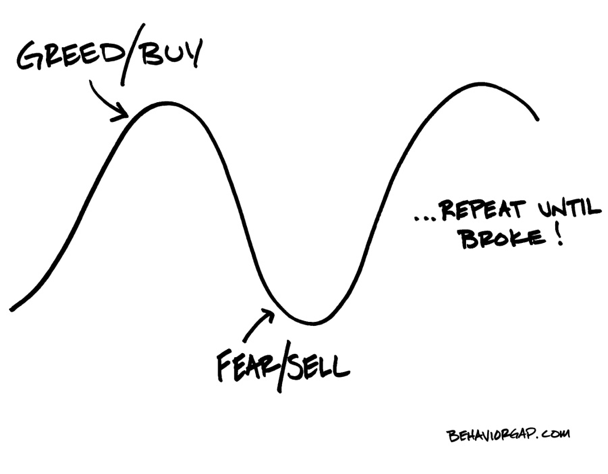 We sell when markets are low and everything feels very risky. We retain, in particular, large portions of our wealth in cash, which is unproductive. Despite what the theorists may tell us, however, none of these actions are necessarily “irrational.” Yes, they reduce long-term returns, but we do get something in return: We get to sleep well at night! The trouble is that this is short-term emotional comfort purchased at an enormous financial cost. Once you have sold out of a turbulent market for emotional reasons, it is almost impossible to get back in again, no matter how good the logical case for it; one simply does not go straight from despair to enthusiasm. The more realistic approach is to accept the need to sleep well at night and then ask how this can be achieved as cheaply as possible. Identify the aspects of investing that make us most nervous and then find targeted ways of reducing this anxiety as cheaply as possible. How should investors build their portfolios? A potential answer: Investors should build portfolios that can address their goals, integrating behavioral finance and modern portfolio theory. Whereas investors in Modern Portfolio Theory consider the money in portfolios as whole, investors in Behavioral Portfolio Theory divide their portfolio money into mental accounts or “buckets,” each associated with a particular goal. Moreover, each goal is associated with a particular time horizon and a particular risk tolerance. Each of life's goals carries a different level of importance, so that it is natural to consider each goal and its attendant risks uniquely. Consider an investor with three goals: a secure retirement, which is 15 years away; college education, which is 3 years away; and a bequest, which is 25 years away. Each sub-portfolio will contain stocks, bonds and other investments, but the proportion of bonds in the education sub-portfolio is likely higher and the proportion of stocks is likely lower than in the retirement and bequest sub-portfolios. In addition to the investment strategy, investors should also consider the liquidity and risk management strategies of their investable assets. Investors will increasingly need to look to their own accounts to support themselves in retirement, treating their 401(k) plans, IRAs and personal savings as their personal pensions. To generate the stream of withdrawals they will need from their portfolios over 30 to 40 years in retirement, investors will need a Retirement Income Plan (a “decumulation” strategy) to ensure they do not outlive their assets. This will require adding volatility risk (and consequently higher expected returns) to their portfolios to offset the longevity risk of outliving their money. 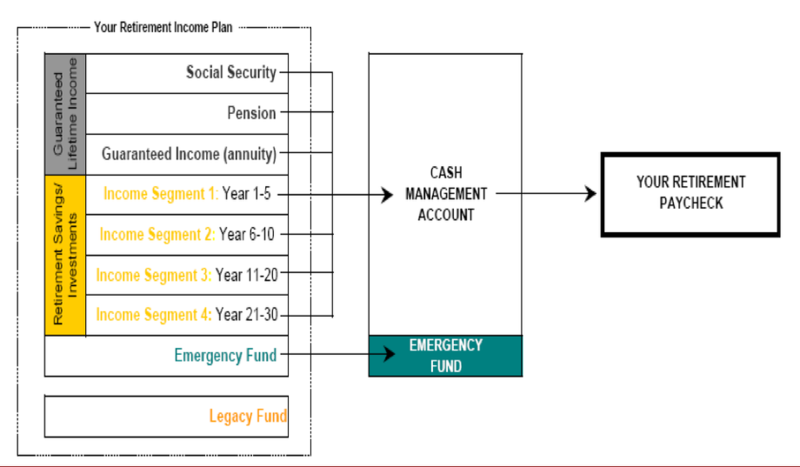 The next chart is a snapshot of the Time Segment Allocation framework, which takes into account the timing of your various income sources in retirement. The approach then divides your retirement assets into several Income Segments that are invested in different asset mixes that coincide with when and how you plan to use the assets. Each segment is meant to fund a specific phase of your retirement and will be invested using a strategy consistent with that segment's time horizon. This approach allows us to determine where your retirement “paycheck” will come from each year. The retirement paycheck corresponds to the periodic amount (growing at the rate of inflation) investors need throughout retirement to maintain the lifestyle they are accustomed to. Emotional comfort is important and necessary, but it can be very expensive. A sequence of comfortable short-term decisions does not often add up to optimal long-term performance. Goals-based financial planning, the behavioral update to Modern Portfolio Theory, gives us the theoretical solution to the long-term optimal portfolio, with more psychologically realistic rational preferences at its core. Do not expose all your investments to the same amount of risk; funds needed in 5 years are invested differently from funds needed in 10 or 20 years. A Retirement Income Plan can be the roadmap to manage your investments to help offset the longevity risk of outliving your money. “Behaviouralising Finance: Portfolio Optimization for the Anxious” - Greg B. Davies, PhD; Private Wealth Management, CFA Institute, 2012. “Innovations in Behavioral Finance: How to Assess Your Investment Personality” - Michael Liersch and Anil Suri; Wealth Management Institute Whitepaper, Merrill Lynch, Spring 2012. “Best of Both Worlds: Integrating Behavioral Finance and Modern Portfolio Theory” - Meir Statman, Wealth Management Institute Whitepaper, Merrill Lynch, Fall 2011. “De-Risking Retirement Income” - Stephen J. Huxley and Brent Burns, Private Wealth Management, CFA Institute, 2011.